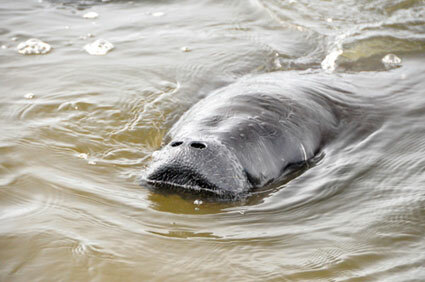 There's a great chance you will see some manatees on your Mosquito Lagoon fishing trip or nature tour. Manatees are large, gray mammals with tails that are shaped like flat paddles. They have two flippers with three to four nails on each. Their heads are wrinkled with whiskers on their snouts. Most Manatees weigh over 1000 pounds, can grow up to 14 feet and live to be about 60 years old. 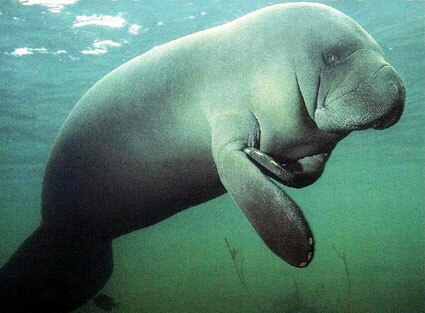 Hundreds of years ago sailors often would mistake Manatees for mermaids. Some say those sailors had been at sea far too long! 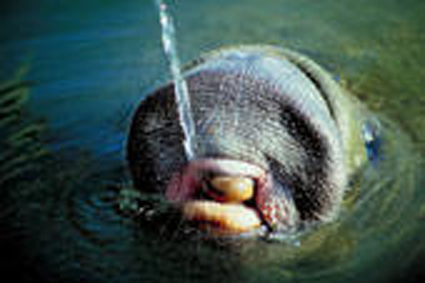 West Indian Manatees are the slowest mammals of Mosquito Lagoon and are one of the world’s most endangered animals. It is an awesome experience to see one. Manatees give birth about every three years with gestation periods averaging a year. The calves nurse and are dependent on their mothers for about 2 and a half years. Twins are very rare. Capt. 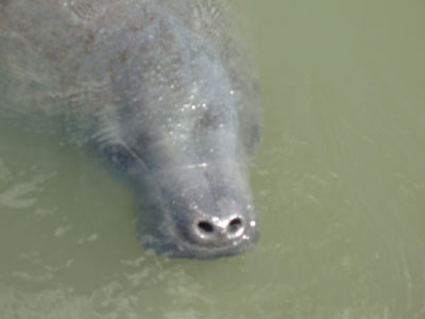 Karty has seen the football sized newborns that are extremely cute minatures of the adult Manatees. We don’t know if Manatees actually need fresh or salt water, but they seem to like fresh better. They can be found in shallow, slow-moving rivers, saltwater bays, canals, and coastal areas, particularly where you would find sea grass beds or freshwater vegetation. Manatees may also be found in the coastal and inland waterways of Central America and along the northern coast of South America. 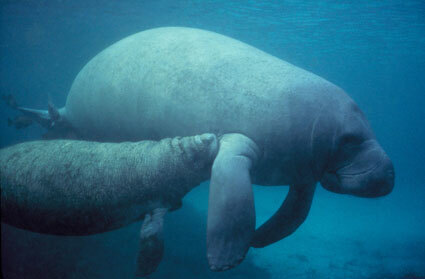 West Indian Manatees originated in the Caribbean. Florida is considered to be their northernmost territory. It became possible for more of them to survive the winters here after power plants were built in Florida which increase the water temperatures around them. Manatees also spend their winters in natural springs, like Blue Springs near Deland, Florida, and they make their ways to the coastal waterways, including Mosquito Lagoon, for spring, summer and fall. We make every effort to be available for your call from 6:00am to 10:00pm EST. Do you want to fish for four or six hours? Where will you be staying or driving from? What are the first names of the other anglers? Is anyone under 18 or under 90 lbs? Manatees are gentle creatures and spend most of their days eating and traveling. They eat between 20 and 60 pounds of plants and sea grass every day. Manatees don’t have teeth, but they do have front molars. They have surprisingly good eyesight. Manatees will need to come up for a breath about every four minutes. When Manatees come up for air, it may sound like a snort. They mostly spend time resting submerged at the bottom or just below the surface of the water. When they are using a great deal of energy, they may surface to breathe as often as every 30 seconds, but when resting, Manatees have been known to stay submerged for up to 20 minutes. 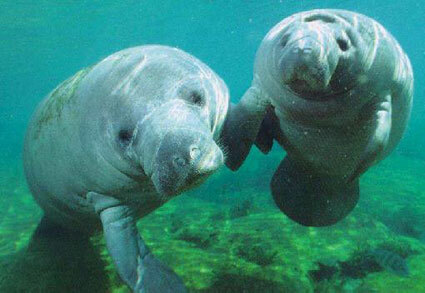 Manatees usually swim about three to five miles per hour, but they can swim up to 20 miles per hour in short bursts. The Manatee's closest relative is the elephant. 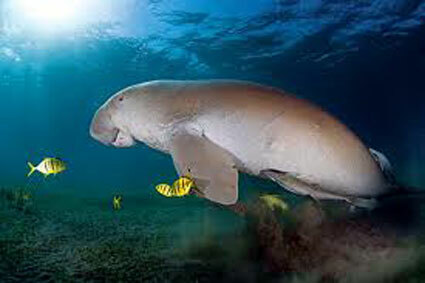 The West Indian Manatee is related to the West African Manatee, the Amazonian Manatee, the Dugong, and Steller's Sea Cow, which was hunted to extinction in 1768. As with wild animal populations, a certain percentage of manatee deaths are attributed to natural causes such as cold stress, gastrointestinal disease, pneumonia, and other diseases. Additional fatalities are from human-related causes with include collisions with watercraft; being crushed and drowned in canal locks and flood control structures; ingestion of fish hooks, litter, and monofilament line; and entanglement in crab trap lines. Ultimately, loss of habitat and rapidly declining water quality due to the spraying of fertilizer and pesticides are the most serious threats facing the Manatees today. We have fished all over and I can say this was one of the best that we have been on. Karty does a very good job explaining how to fish the flats and puts you on the fish.